This is a side that I serve often yet never gets old. 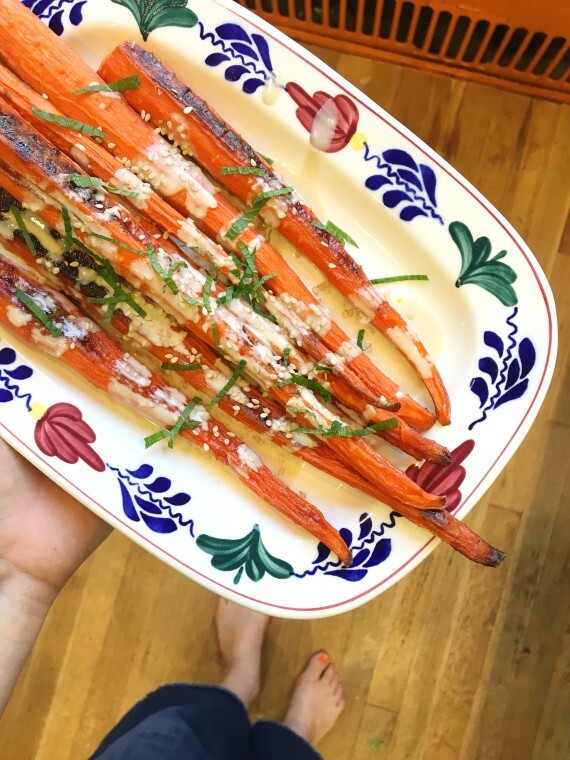 I always have carrots on hand, whether from our CSA box, the local Greenmarket or the supermarket since carrots stay fresh in the crisper drawer for weeks. I consider them a pantry staple! I do lots of things with carrots, including this shredded Moroccan carrot salad (which I posted in 2011 and is missing some pics now that I look at it again!) and this amazing hot or cold carrot soup, but this tahini carrot dish has become one of my recent favorites. If the carrots are farm fresh, I don’t even peel them and instead give them a good scrubbing. The rainbow ones I used Friday we picked up at a roadside farm stand in Guilford Vermont, and I scrubbed some and peeled others since I also used some grocery store carrots. Scrub (or peel) the carrots then roast them in a 350F with a thin brushing of oil, sprinkled with salt and sesame seeds until they’re nice and brown, around 30 minutes. While they’re roasting, make the tahini sauce. I looooove tahini, especially when it’s extra lemon-y and garlic-y, but on this particular day I was out of lemon (how does that even happen in my house?!) so I reached for an orange instead and it was surprisingly tasty, as orange and carrots are such a complementary combo. The tahini sauce is super simple: tahini paste, orange zest, orange juice, fresh garlic, salt and a little olive oil and water to smooth out to the consistency you prefer. 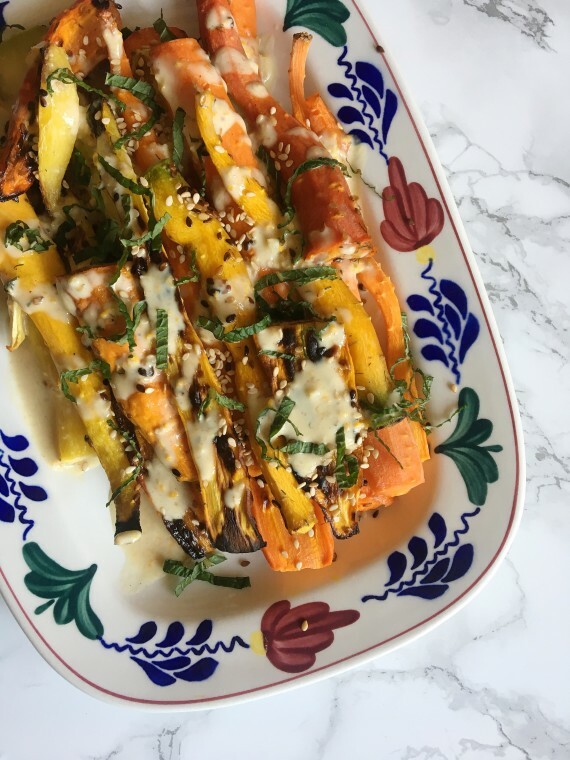 When the carrots are out of the oven, top with some more sesame seeds, drizzle with tahini sauce and sprinkle on some fresh mint. Here is another version I made a few weeks ago with thin carrots that I didn’t cut in half. Think this is a combo you’ll try?